Lowriding evolved into a full-blown car culture in the years following World War II, when members of the Los Angeles Mexican American community found in lowriding an outlet for self-expression and cultural pride. In the late 1940s enthusiasts began turning cars into works of art. Affectionately nicknamed ranflas, carritos, or carruchas, the car's became highly ornamented symbols of identity, representing both the individual car owner and his or her culture. Many lowriders began to organize car clubs in the 1960s, the same period in which hot rodding and cruising became popular among predominanty Anglo youth. Lowriders distinguished themselves from hot rodders by driving "low and slow" - "bajito y suavecito" - sometimes dragging the body of their cars so low to the pavement that they created dramatic sprays of sparks. Lowrider customizing began to incorporate creative painted murals with historic and religious themes, featuring figures such as la Virgen de Guadalupe, Aztec warriors, as well as images from pop culture. 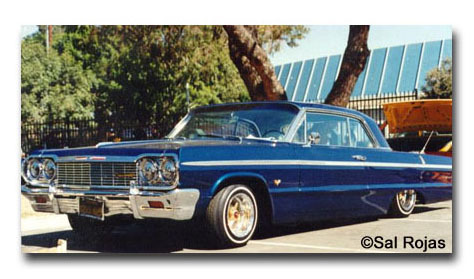 Lavish additional features -- sound systems , upholstery, glass etching and hydraulics - amplified the lowriding experience. Like other automotive hobbyists, lowriders spend considerable time, money and skill on perfecting their rides. In the 1960s, cruising on Whittier Boulevard and at other urban locales was an important form of public display for lowriders, but a ban on cruising in the 1970s turned the car show into the key locale for lowriding culture. Whether the cars are found on the street or in the showroom, the lowriding tradition remains a vibrant phenomenon expressing arte y estilo. At the video kiosks, watch "Hopping,""History of Hydraulics," and "Cruising." The murals on the vehicles often tell a story. Can you identify historical or religious symbols in any of the murals? What types of stories are told? How does the name of the car or bike contribute to the story? Compare the lowrider cars of the 1950s in this exhibit with the hot rodders of the same era by visiting the Streetscape on the first floor, in front of Jamm's Drive-In Restaurant. Watch Low and Slow on the gallery's large screen monitor. Arte y Estilo: The Lowriding Tradition, our exhibition catalogue, can be viewed in the resource area. Each generation brings a unique aesthetic vision to its car customizing. Compare the murals on a pioneering car like "Gypsy Rose" to a more contemporary example, such as "Midnight Illusions." What is the difference? Lowriders are diverse group of people. While this exhibtion features the cars of Mexican Americans, African Americans as well as some Asians and Anglos are also active in lowriding. Lowriding is popular in the Southwest and it Texas, and more recently, on the East Coast. Lowriders can even be found in countries like Japan. Although the car clubs began as male-oriented fellowships, women have become increasingly visible. For example, filmmaker Monica Delgado talks about her ties to lowriders in the gallery video, Low and Slow. The stereotype of street violence has often been attached to lowrider culture, but many lowriders consider the car clubs to be an important alternative to gangs. Car club membership is an incentive to be a responsible and creative community advocate. Family is important is most lowriding clubs, and members of the younger generation grow up customizing bikes and go-carts as a crucial first step in learning the art and skills of self-expression. Legendary northern homeland of the Aztec people, refers to the Southwestern United States, which belonged to Mexico until the 1830s. A lowered, usually mildly customized '30s or '40s lowrider. A paint finish achieved by spraying a base coat of silver. gold, or another color and then applying several coats of contrasting translucent top-coat colors. To lower a car roof by removing sections of metal from the windshield posts, door pillars, and rear roof quarters. A cube-shaped metal placed between the axle and springs to drop the ride height of the chassis.